Yuderkys Espinosa Miñoso is a thinker, activist, essayist and teacher committed to the radical–movementists flows against racism, (hetero) patriarchy and colonialism. Born and raised in an Afromestizo family of the poor neighborhoods of Santo Domingo, Dominican Republic, she has lived as a migrant thirteen years in Argentina and now in Colombia. From there she mobilizes and runs through the territory of Abya Yala, committed to a project of political formation, and to the development of a critical, anti-racist, decolonial, Latin American feminist thinking. One of those who very early welcomed the proposal of Maria Lugones on the development of a decolonial feminism, she ended up becoming one of its main references in Latin America. Yuderkys Espinosa Miñoso is an invited guest of Bodies of Knowledge. Her main talk and activities take place in Bodies of Knowledge at Sargfabrik (Goldschlagstraße 169, 1140 Wien) on Fr. 27.05 18:30 and continues on Sa. 28.05 in the afternoon with networking workshops for Black & POC. 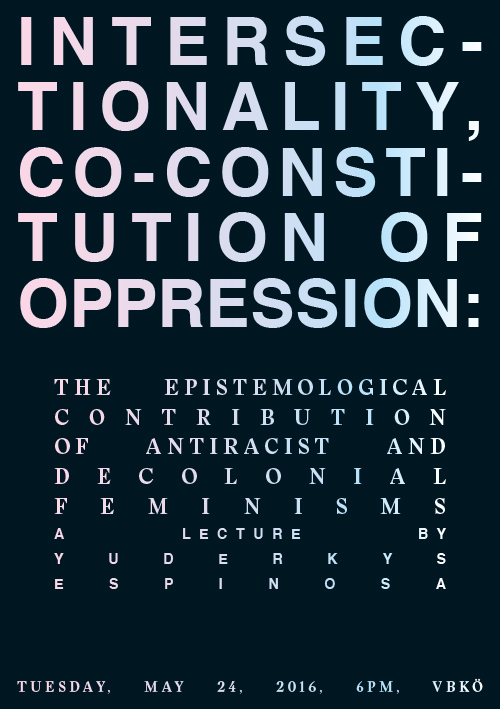 Her conference „Intersectionality, co-constitution of oppression: the epistemological contribution of antiracist and decolonial feminisms“ is part of Anticolonial Fantasies and is organized by Imayna Caceres with the support of Verena Melgarejo-Weinandt, the Institute of Art and Cultural Studies (IKW) and the Vereinigung bildender Künstlerinnen Österreichs (VBKÖ).